Aloha & Welcome to Hotel Molokai! 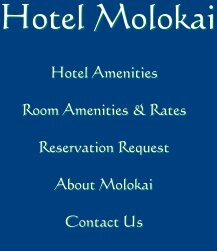 Hotel Molokai is located on Kamiloloa Beach, approximately 1 1/2 miles from the center of Kaunakakai, Molokai's largest city. Centrally located, this nostalgic "Hawaiian Hideaway" offers polynesian-style accommodations with a full service restaurant and lounge with nightly Hawaiian entertainment. Molokai is an island where the past and the present mingle, where the traditions of the unique Hawaiian culture have been preserved and are yours to share.